Now that I’ve been to 158 countries, it’s kinda cool being about to watch CNN/BBC and see all sorts of places in the news that I’ve been. But, for some reason these last two weeks, the news from northern Iraq / Iraqi Kurdistan is really bothering me. Reflecting on my photo album, it’s really amazing how much we managed to see despite the circumstances, and especially given where things now – I count myself very fortunately to have been there. When I went there a few years ago, I really enjoyed it. It was my first “you’re going WHERE? !” country, and the people were fantastic and it was really an eye opening trip. So, I’m going to repost here that trip report, with a few edits/thoughts from the last few years. Enjoy! One, hopefully arrange a driver to drive us into the countryside the next day, and two find some dinner. Number one, again, we weren’t in the best position to negotiate. Like I said earlier, there aren’t exactly many tourists here, so if you want to arrange things there aren’t many options. The guy at the front desk made some calls over the next hour, and managed to arrange us a driver for the day. There were two waterfalls we wanted to see on the mountain road up to Hadji Omaran at the Iranian border. 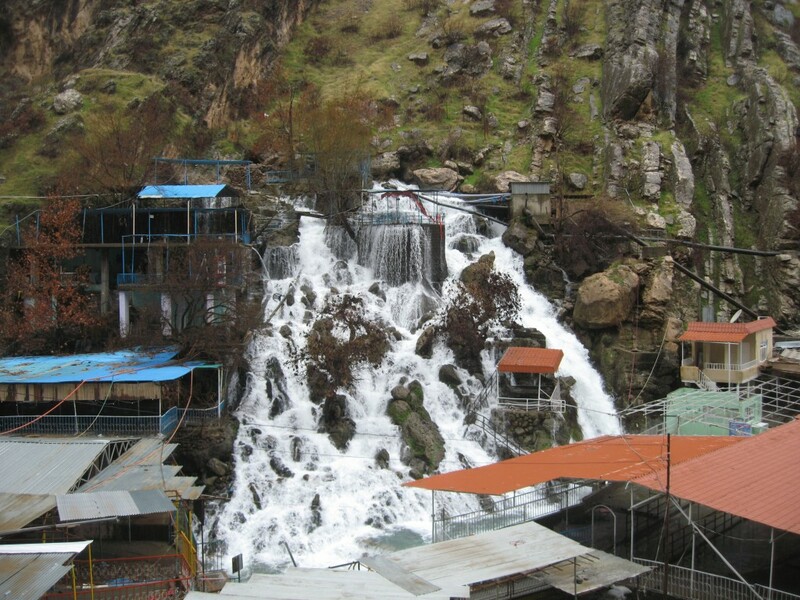 Our plan was to drive past the Gali Ali Beg waterfalls and the Bekhal waterfalls, on the way to the mountainous region by the border. A driver was found for the full day trip, which seemed semi expensive, but how often do you get a chance to be driven around the countryside in Iraq?! 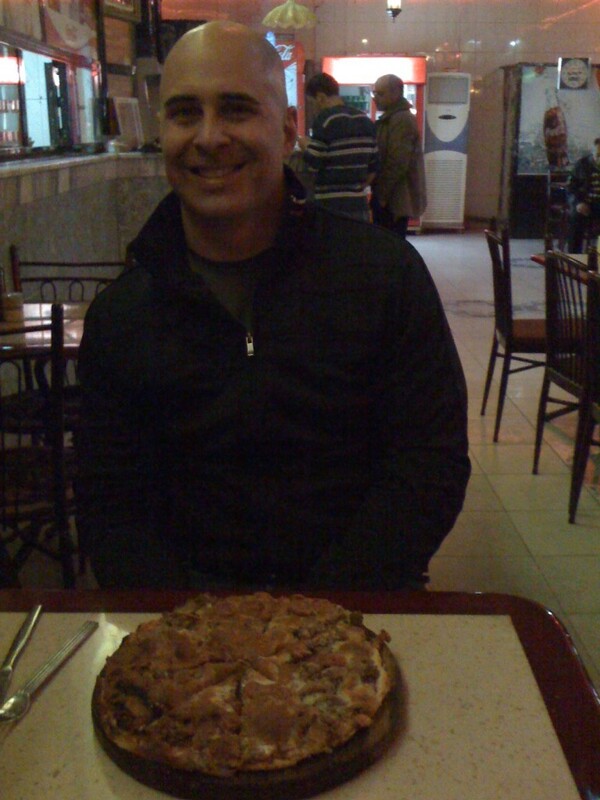 That sorted, we headed off the the Mehdi Mall to hopefully find somewhere to arrange dinner. We didn’t manage to find anywhere to get anything to eat there, but did find a bowling alley, and lots of very unusual Christmas decorations. 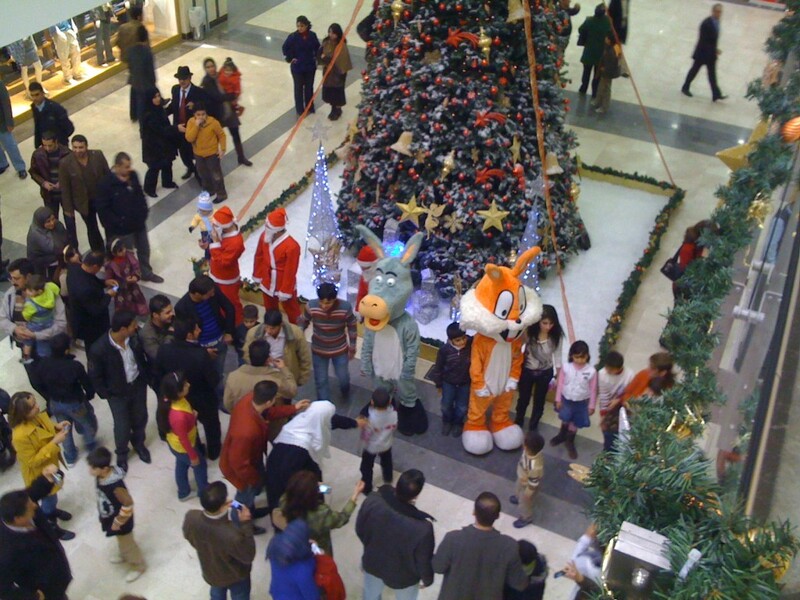 Now, Erbil does have a rather sizable Christian population, but it seems they’ve managed to take the American commercialization of Christmas to a whole new level! Looking back now, it’s sad to see what’s happening to the Christian populations in northern Iraq. I didn’t quite understand at the time just how large this population was, just that it existed. 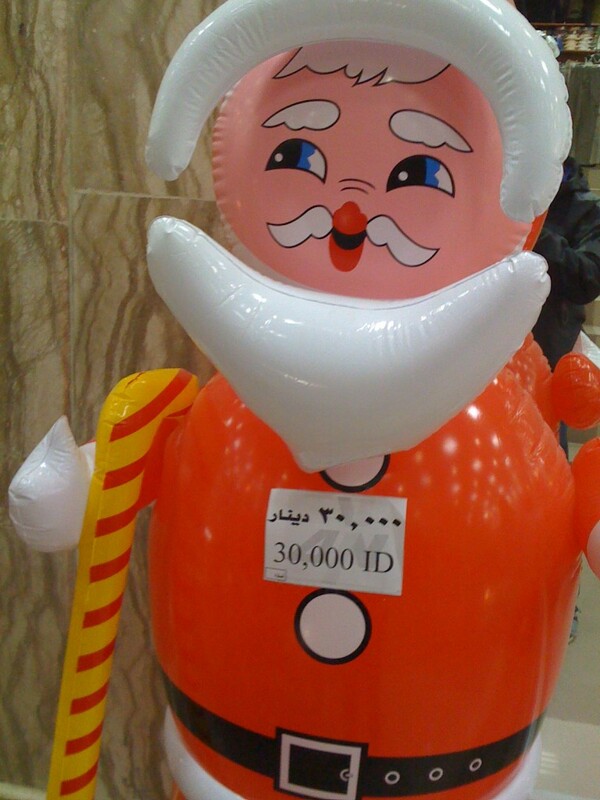 Want a blow-up Santa? For just 30,000 Dinars you’re covered! 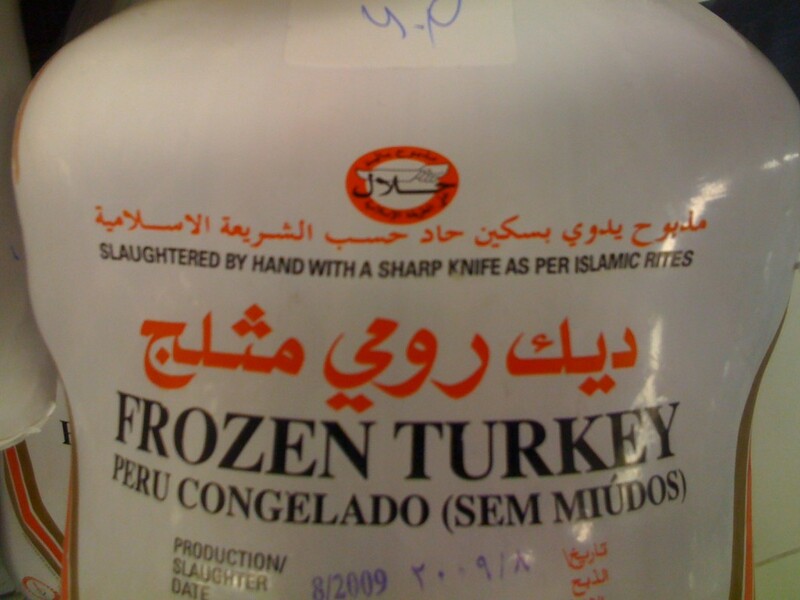 They did, however, have a big grocery store in the mall selling, of all things, turkey! Then it was back to the Ankawa Palace and off to bed early for the big day trip adventure the next day. Our driver met us early, and soon we were winding out of the city in yet more very heavy rain towards the Gali Ali Beg waterfall. 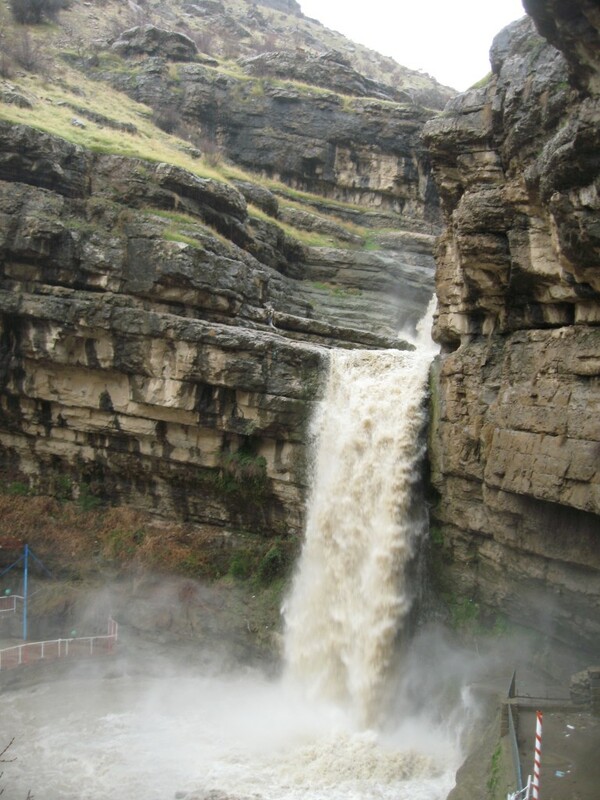 This is one of the most famous waterfalls in Iraq, and probably one of it’s most famous natural features. It is even on the back of one of the dinar notes. Unfortunately, we were pretty disappointed when we got there, because of the amount of litter and rubbish just strewn all over the place. It was really rather sad. The other waterfall we stopped by was the Bekhal waterfall. Again, very similar. They were really cool to see, but the amount of litter was just really sad. In both places, we were the only people seeing them, but some of this probably also had to do with the rain. 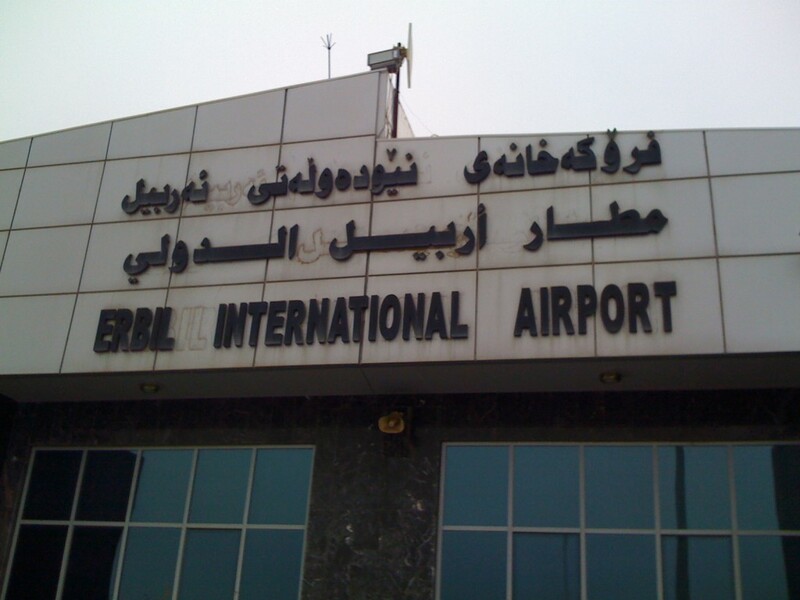 We made it to the airport in Erbil in plenty of time, and soon were through the several layers of security and in the check-in area. There was a vehicle-check, an x-ray in a building a couple hundred metres from the terminal, and then finally another layer before getting into the terminal. Oh, not to mention another layer before getting into the “gate” area. Immigration was a breeze, and soon we were really there…we were in Iraq. But wait…where are the taxis? Now, I guess we hadn’t really planned this part too well, because it’s not like the Erbil International Airport was really prepared with a modern tourist infrastructure. After a bit of asking around, we were directed to some folks with overpriced transportation, who offered to take us to our hotel. We really weren’t in a position to negotiate, and since they all needed special security clearances to get into the hotel, I guess it was pretty fair. One, hopefully arrange a driver to drive us into the countryside the next day, and two find some dinner. Number one, again, we weren’t in the best position to negotiate. Like I said earlier, there aren’t exactly a lot of tourists here, so if you want to arrange things there aren’t many options. The guy at the front desk made some calls over the next hour, and managed to arrange us a driver for the day. There were two waterfalls we wanted to see on the mountain road up to Hadji Omaran at the Iran border. So up at the crack of dawn to catch our hotel-arranged shuttle to Ljubljana Airport. Nothing exciting to report here. The airport was rather small, check-in was confused and slightly chaotic (as was security) but soon we were on the other side and in the promised land: the “lounge.” This might be one of the most uninspired lounges I’ve ever been in, but at this early hour it had the single most important thing in the universe to me: a coffee/espresso machine. Several shots later I was approaching human, and life was good! Wow – this was the same aircraft (and same seat) I had been in two days prior. What are the odds! 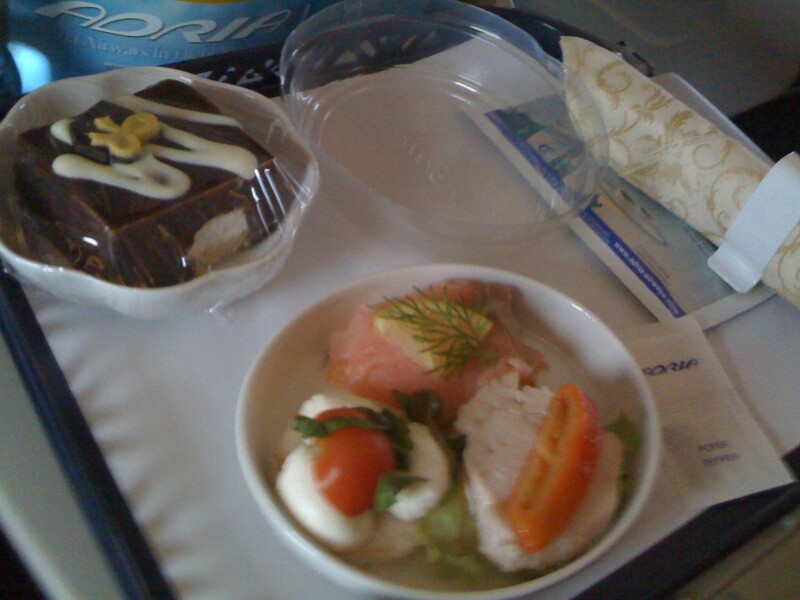 Even on this short flight, a snack was served: something you would never see in the US! I hadn’t much intention to post this, but since I posted a couple others several folks have asked about this trip. Since I’m off for a 35+ day trip in a week this will be brief, but I do want to update this trip! 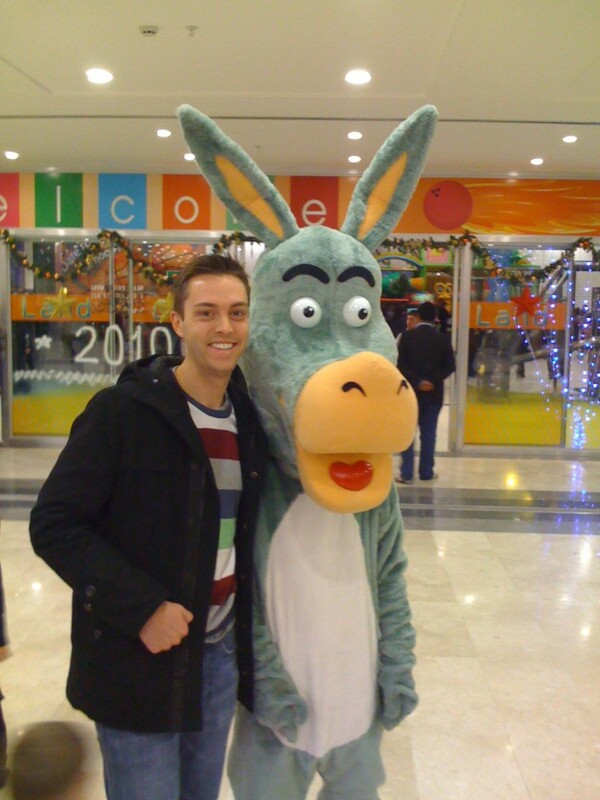 I have this…thing…for going to strange places for New Years. 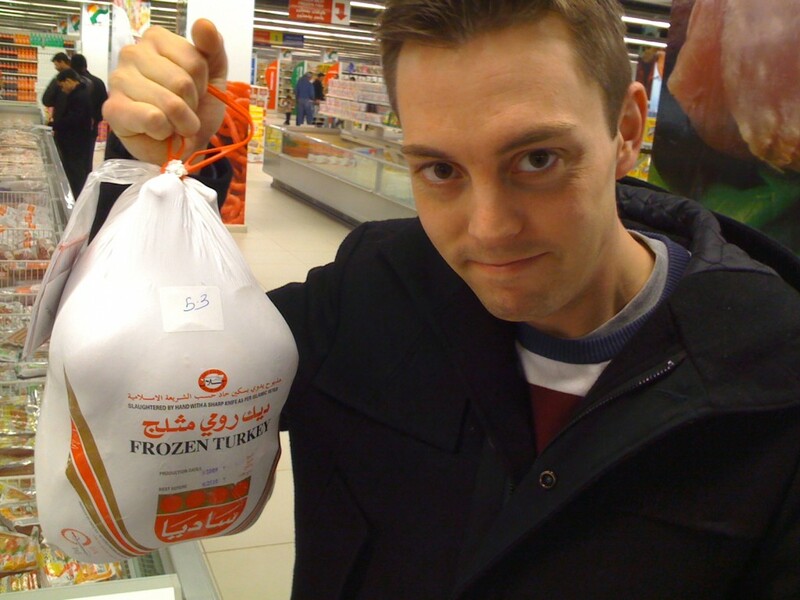 This year, we went to Afghanistan. Last year…it was Iraq. I’m hoping in a few months to set foot in that place full of pirates without a name. You get the picture. There are lots of pictures, lots of bacteria, and hopefully I can fill in a few blanks on places that we found remarkable few details on online before going there ourselves. I admit – it was a bit insane to head to Iraq with absolutely nothing booked but….I guess that’s what adventure is all about!